FCI-Standard N° 116 / 23.01.2009 / GB - TRANSLATION : Tim Taylor and Raymond Triquet. Revised by Jennifer Mulholland 2007. Eyes : Oval, set wide apart. The space between the two inner cornersof the eyelids is equal to about twice the length of the eye (eye opening). Frank expression. The haw must not be visible. 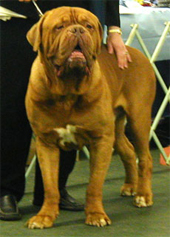 Colour : hazel to dark brown for a dog with a black mask, lighter colour tolerated but not sought after in dogs with either a brown mask or without a mask. Bulldoggy hypertype : Flat skull, muzzle measuring less than a quarter of the total length of the head. Swollen fold (roll) behind the nose. Important fold around the head.